It all began in 1984 when Linnaea Phillips created a gathering place for conversation, music, social events, and, of course, sharing good food and drink. With the help of many friends, her vision of a classic coffee house became a reality. Linnaea's Cafe today is still a beloved fixture of downtown San Luis Obispo and a popular place for out-of-towners to visit on their way through. 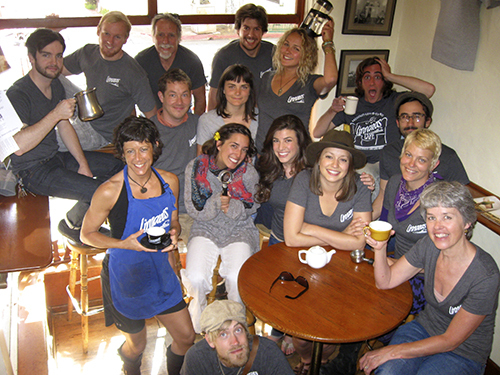 In 2008, Linnaea sold the café to her longtime manager, Marianne Orme, who's dedicated to keeping Linnaea’s the eclectic and welcoming center of San Luis Obispo’s coffee house culture. Linnaea’s remains a popular showcase for rising local artists and host to a variety of musical performances, poetry readings, art installations, jazz jams, and other events. There are three distinct environments to hang out in at Linnaea’s. When you first walk in there is window seating to watch the world go by. Well, the uniqueness of Garden Street anyway. Then head back to the main living room filled with tables, art, and a bookcase to peruse. Continuing further, you enter the garden where you can sit in the sun or under the flowering arbor for some shade. The table next to the fish pond is probably the most popular. Linnaea's has become a much-loved alternative to the corporate work environment. Our relaxed yet lively atmosphere is popular with businesspeople and students alike, providing a refuge and welcome respite from busy city life. We've become a second home to numerous students and members of the community over the years. We hear it again and again. "Walking into Linnaea’s is like coming home." With such a unique and warm environment, free Wi-Fi, plenty of good food, good coffee, clean bathrooms, and free entertainment. Why go anywhere else? 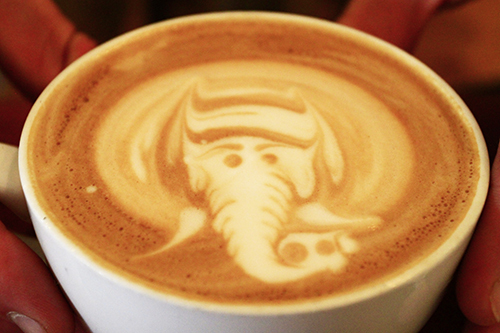 In choosing our baristas, bakers, and cooks, we look for someone who loves, and wants to work at Linnaea’s. We believe happy employees make their customers happy. Working at Linnaea’s is not just a job, it's a big step in the path of life. Many lifelong friendships are made here at Linnaea’s, among staff as well as between staff and customers. There's just something special about the place. San Luis Obispo (SLO, SLOtown, or San Luis) is the county seat and home of California Polytechnic State University (Cal Poly) with a population of 45,000, about 1/3 of whom are college students. It is almost exactly half-way (about a 4 hour drive) between Los Angeles & San Francisco, and just a few miles from the coast, where Highways 1 and 101 meet. It is a quiet and beautiful town, with a very strong sense of community. Town slows down a bit during the first part of the summer but picks up in August when Europe takes a vacation. San Luis has a beautiful downtown, wonderful outdoor concerts during the summer, and great weather year round. We are blessed to live in such a beautiful place.